Preheat oven to 180°C/350°F. Cut off ends of pumpkin, halve, and remove seeds with a spoon. 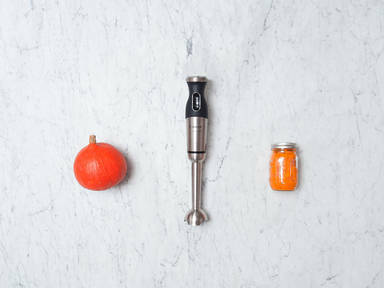 Transfer pumpkin halves to a baking sheet, and roast in the oven at 180°C/350°F for approx. 40 min., or until fork-tender. When pumpkin is cool enough to handle, scoop out flesh and add to a large bowl or food processor. Purée with a hand blender or in a food processor until smooth. Store refrigerated in an airtight container. Use for a variety of baked goods, soups, and other savory dishes. Enjoy!